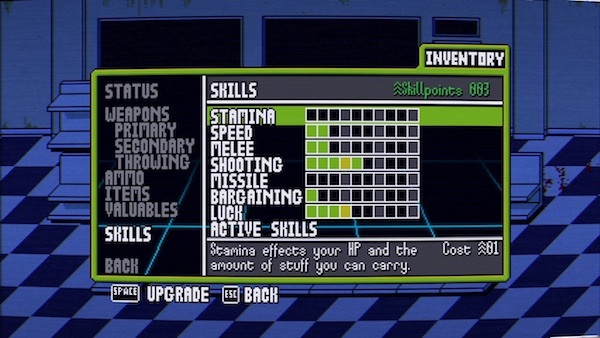 ead Pixels II certainly makes a strong impression. This side scrolling zombie shooter has an aesthetic that many will go nuts over and is the sequel to 2012’s Dead Pixels which debuted on Xbox Live Indie Games before moving to PC. Almost four years have passed since the release of the first installment of Dead Pixels and the developer is, he assures me, battening down the hatches and going all out to finally get Dead Pixels 2: Straight to Video out the door. 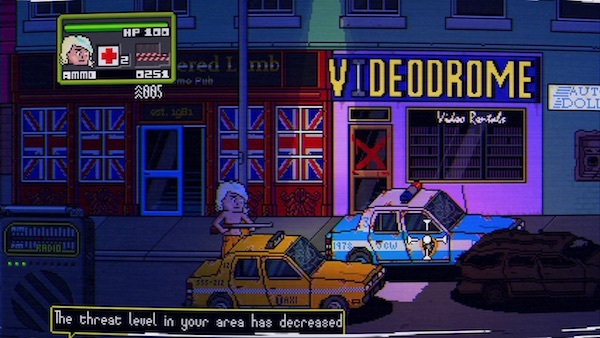 Dead Pixels 2 sees you take control of a random character and along with up to 3 friends you have to try and make your way through the zombie hordes. 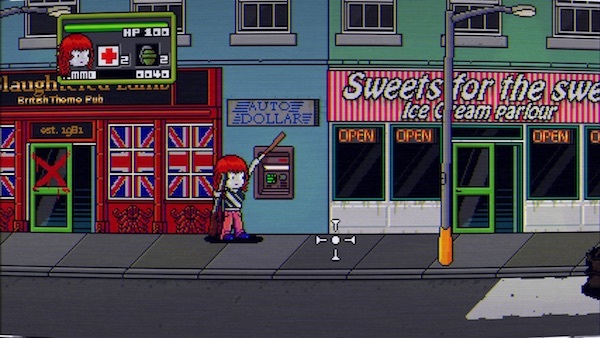 The game uses some wonderfully striking pixel art (reminiscent of the Scott Pilgrim game and in some instance D-Gen on the Amiga) . A look somewhere between a side scrolling fighter like Final Fight and the original Plants Vs Zombies there is a wide cast of characters shuffling about the screen – including a particularly vicious looking zombie poodle! The story all the action is hinged on is that in 1983 the city of New Hexington was destroyed after a chemical spill caused the dead to come back to life. By 1987 the whole of America had succumbed to the T.O.X.I.N. virus. This is straight out of some terrible, straight to video, B-tier movie of the late 80’s/early 90’s. And that’s exactly what developer CSR Games is aiming for with the tone of their game. This ethos is peppered throughout the game from the items and text around the world to the flickering VHS filter and CRT burn-in looks. This side scrolling shooter is 80% co-op blaster and 20% RPG all wrapped up in a targeted semi-randomly generated world. Which is to say that levels will be a known length (a street will have 32 buildings for instance) but what that building is, contains and looks like will be random. As will the placement of enemies, items, set decoration (ie broken down cars, zebra crossings, traffic lights etc) and shopkeepers. With a strong look and a tongue in cheek feel Dead Pixels 2 has a lot going for it, even watching from a distance it looks like solid fun. Take control and your initial feelings are solidified. Controls are responsive and simple enough, especially with a controller. 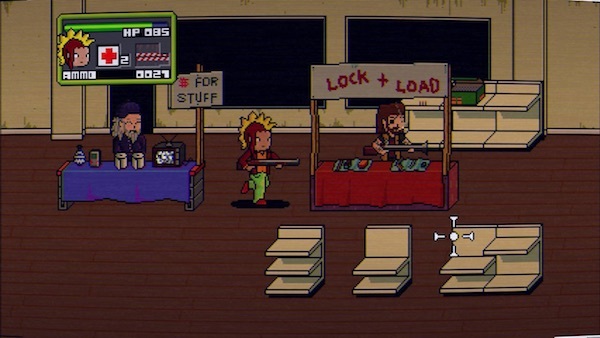 Simply using the triggers to fire left or right and the bumpers to thrown items left or right as well as the left stick to move the random, yet customisable character. Zombies drop coins that you can then spend in the vendors dotted around each compact level to buy better weapons, ammo, accessories or health items. You earn skill points as you progress. These can be dropped into various skills like Stamina, Speed, Shooting, Melee etc. Each one helping to increase the odds that your little avatar will survive the zombie hordes as your character levels up. The game still has a few rough edges. The developer, John Common, freely admits he has some tidying up to do, a narrative to add and has a host of little tweaks he wants to implement. Oh and the online multiplayer is still yet to be fleshed out. I do wonder if, after 4 years on the project, the developer is finding it hard to draw a line in the sand as far a features and “nice to adds” go. I hear these sorts of tales often from devs and friends and as a developer many years back I’ve fallen foul of this myself. One other niggle I had was at times you could just easily sprint through the levels dodging the hordes – you’d likely come unstuck later with bosses though as you’d be underpowered to deal with them. Regardless it must be said that my playthrough of Dead Pixels 2: Straight to Video was great fun. A great look and feel that has been lovingly honed over countless hours of tweaking and testing. Dead Pixels 2 is set to release on Windows, Linux and Mac “real soon!” with a possible hint towards a PS4 & Xbox One release at a later time if things go well and an external studio can be found to undertake the work. Fans of the original game will be pleased that the same core mechanics have been retained but CSR Studios have built up layer after layer of content on top of that core concept. What’s left is a fun co-op shooter with bags of style that captures a genre and time very well indeed. How it comes together as a whole will be interesting to watch and certainly something you should keep an eye on going forward. Dead Pixels 2 can be pre-ordered now for $10/£7 from the developers site giving you access to all ongoing beta builds as well as a Steam key for the finished game and original game as well as DRM free editions as well.